Krushi Sevak Bharti 2019 is started in all districts of Maharashtra. Today we are providing Krushi Sevak Exam Syllabus as all the candidate started preparation for Krushi Sevak Exam. Recently, Krushi Sevak Bharti is announced by Agree Department for 1416 Krushi Sevak Posts in whole Maharashtra. So, this is really best opportunity for students who are searching for a government job. Exam Syllabus is the most important factor before starting preparation for any type of exam. So, we are updating here about Krushi Sevak Syllabus which is really useful for Krushi Sevak Exam. 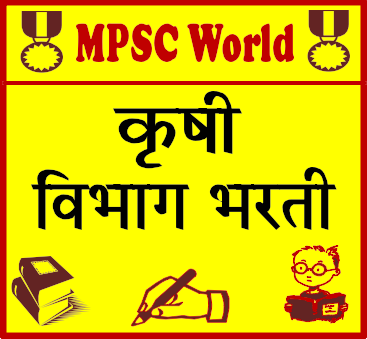 Read below post to get the syllabus for the Krushi mega exam 2019. महाराष्ट्र कृषी विभागामार्फत “कृषी सेवक” पदासाठीची मेगा भरती जाहीर करण्यात आली आहे. म्हणून आम्ही येथे कृषी सेवक परीक्षेच्या तयारीसाठी महत्वाचा असा अभ्यासक्रम प्रकाशित करत आहोत. तरी शेवटपर्यंत माहिती वाचावी. कृषीसेवक परीक्षा ऑनलाइन प्रक्रियेद्वारे मराठी भाषेत घेतली जाईल. कृषीसेवक परीक्षा हि एकूण 200 गुणांसाठी होईल व त्यात 200 प्रश्न राहतील. परीक्षा कालावधी 2 तास राहील. ऑनलाईन परीक्षा हि MCQ पद्धतीत होईल. परीक्षेचा दर्जा हा ईयत्ता 10 च्या अभ्यासक्रमावर राहील.